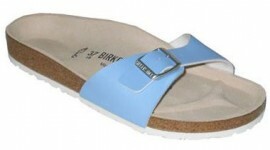 100% Genuine Birkenstock Madrid. The must have mule as worn by Victoria Beckham. The strap is made from BIRKO-FLOR, which is a skin friendly and extraordinarily tear resistant.